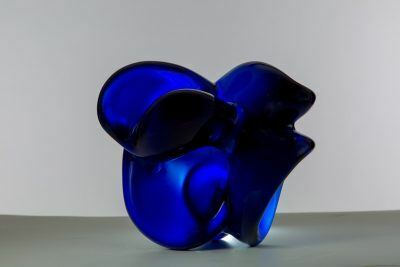 A highly talented sculptor from Monterrey, Nuevo Leon, Leal’s elegantly sensuous works have received accolades from leading art critics in Mexico. She began her professional studies at the University of Monterrey, where she completed a B.A. in Psychology in 1983. Later, her passion for the arts led to the study of sculpture and photography, where she found her true path. Leal’s artistic pursuits have included work in various media; however, it was sculpting in wood and stone that allowed her creativity to truly take flight. Between the years of 2010 and 2013 her development reached a remarkable level of maturity with her Desvarío (Ravings] series in 2010 at the Current Mexican Art Gallery and later Murmullos [Murmurs] in 2013. Both were extremely well received, with the sort of glowing reviews that have been common with her work. Most recently, Leal was awarded a scholarship from the Nuevo Leon Council for Culture and the Arts. For Leal, the creative process represents a path to spiritual insight and personal expression. She considers it a transformative encounter in which the sculpture does not acquire a final shape until her essence imbues it with character and intimacy. She has taken great inspiration from the desert and the mountains of the Sierra Madre mountain range near her birthplace, which manifests in her work as the slopes and curves that are reminiscent of the rugged landscape. In addition, her favorite materials are those found in the region: mesquite and cedar wood, alabaster and black marble. In 2014, the artist began a new series of sculptures using materials such as blue rock crystal and obsidian. This has created a new direction in her work that flows from the challenges of manipulating materials that are both vulnerable and beautiful. In doing so, Leal strives to release the life force that is frozen within these natural materials. Because of the complexity of sculpting her creations, few are made each year and Leal’s work is very much in demand.